The outermost surfaces of plants are covered with an epicuticular wax layer that provides a primary waterproof barrier and protection against different environmental stresses. Glossy 1 (GL1) is one of the reported genes controlling wax synthesis. This study analyzed GL1-homologous genes in Oryza sativa and characterized the key members of this family involved in wax synthesis and stress resistance. Sequence analysis revealed 11 homologous genes of GL1 in rice, designated OsGL1-1 to OsGL1-11. OsGL1-1, -2 and -3 are closely related to GL1. OsGL1-4, -5, -6, and -7 are closely related to Arabidopsis CER1 that is involved in cuticular wax biosynthesis. OsGL1-8, -9, -10 and -11 are closely related to SUR2 encoding a putative sterol desaturase also involved in epicuticular wax biosynthesis. These genes showed variable expression levels in different tissues and organs of rice, and most of them were induced by abiotic stresses. Compared to the wild type, the OsGL1-2-over-expression rice exhibited more wax crystallization and a thicker epicuticular layer; while the mutant of this gene showed less wax crystallization and a thinner cuticular layer. Chlorophyll leaching experiment suggested that the cuticular permeability was decreased and increased in the over-expression lines and the mutant, respectively. Quantification analysis of wax composition by GC–MS revealed a significant reduction of total cuticular wax in the mutant and increase of total cuticular wax in the over-expression plants. Compared to the over-expression and wild type plants, the osgl1-2 mutant was more sensitive to drought stress at reproductive stage, suggesting an important role of this gene in drought resistance. The online version of this article (doi: 10.1007/s11103-009-9483-0) contains supplementary material, which is available to authorized users. 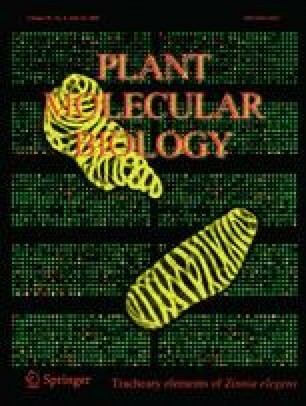 This work was supported by the grants from the National Natural Science Foundation of China, the National Special Key Project of China on Functional Genomics of Major Plants and Animals, the National Program on the Development of Basic Research, and the Ministry of Education of China (No 707045).